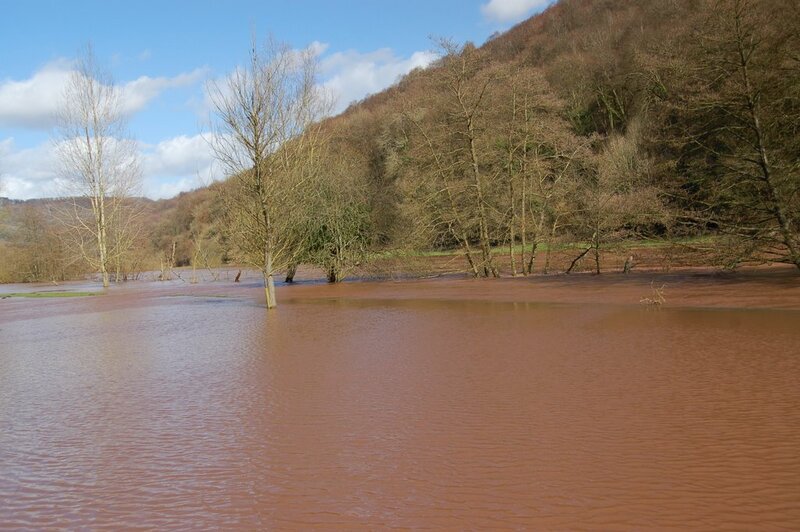 It’s been raining a bit in Wales . . .
. . . so we’re a little flooded. Happens each year (more with global warming, no doubt!) and does not matter to us for the good old builders of our house built it safely up the side of the valley rather than in the flood plain which seems to have been the fashion among imbecile planners in the UK for many a year. It is quite dramatic, though. 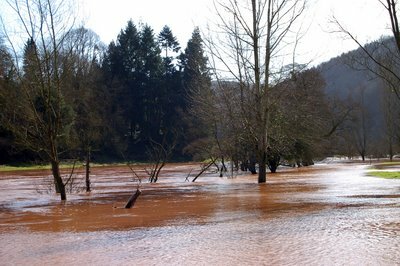 What those of you who have not yet come to visit us and seen the Wye in its detumescent state, as it were, have to realize is that the trees you can see in both of these photos – the ones which are sticking up out of the water – these are all on OUR side of the river. The strange terracotta colour of the water is also absolutely genuine. The river has a normal colour at normal times but lots of rain brings mud from the fields of Gloucestershire into the river Lugg (how anglo-saxon can you get!) which is a tributary of the Wye and thence past us and into the sea at Chepstow. There is no reason whatever for posting all this. I do it simply because I am taking the greatest delight in being able to! The fact that I can take some photos this morning, fiddle a bit on the computer and then friendly blog-followers in Orkney (hello Norman!) or Australia (hello Guy! ), or wherever, can know precise, if totally unimportant, details about our lives as if they lived next door . . . is just fun and friendly and generally life-enhancing!